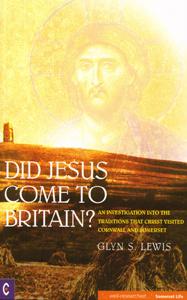 DID JESUS COME TO BRITAIN? "And did those feet in ancient time walk upon England’s mountains green? The many traditions and legends of Jesus's travels to Britain are deeply impressed into our culture, thanks particularly to the famous allusion by William Blake. These tales tell that, while still a boy, Jesus accompanied his uncle Joseph of Arimathea - an importer of metals - on expeditions to Cornwall to engage in the tin trade. Later, it is said, Jesus made additional trips in which he visited the location of the Druid's school of learning, Glastonbury. These are charming and romantic stories, but do they have any historical foundation? Using the work of fellow researchers as his starting point, Glyn Lewis studies the locations that Jesus is said to have visited - from Cornwall to Somerset - and produces some striking evidence, presented here in combination with his own fine photography and some useful maps. Lewis's original research is combined with broad and insightful analysis of the existing material, making a convincing case for Jesus indeed having walked "upon England's mountains green".